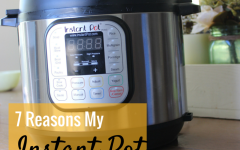 It’s no secret that pressure cooking is NOT a new idea. However, what I knew of pressure cooking when I was younger was that it was a pot with a top that sealed and a dial. I knew that you had to have it just right in regards to pressure or you would have a hot mess on your hands (literally) a messy kitchen, or an injured you! So you might be thinking… WHY in the world would I want to take a chance with this thing? 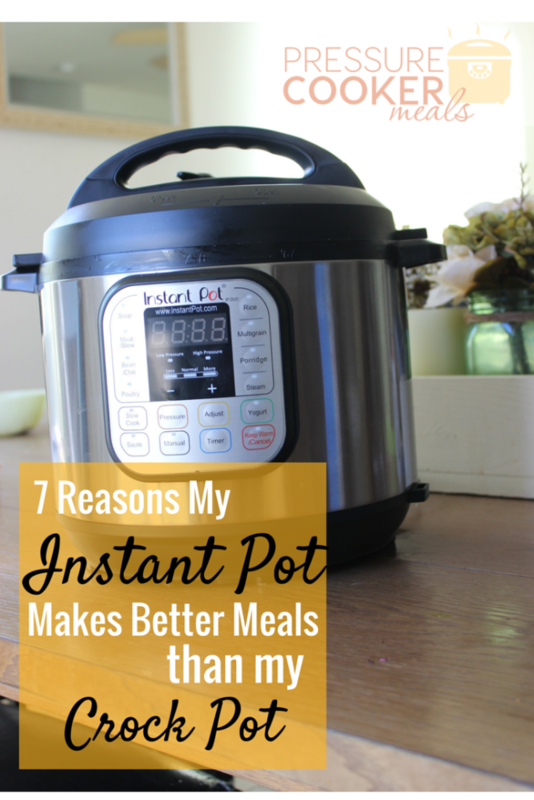 Well, I’m here to put your mind to ease with 7 Reasons My Instant Pot Makes Better Meals Than The Crock Pot. Long gone are the days where you have to babysit a stove top pressure cooker. There are programmable pressure cooker s that do all that thinking for you! Matter of fact, I’ve been using one for my family for over 3 months now. I’m SO not an awesome cook like my husband, and I have yet to have a bad meal (or an accident) with ours. Here are several points on how pressure cooker meals have changed our eating. You have very few limits with a programmable pressure cooker. You can make roasts, stews, chicken wings, hard boiled eggs, oatmeal, and even cheesecake and brownies! The pressurized steam actually intensifies the flavor of your foods – your veggies taste fresher! Unlike the crock pot, where they have been cooked for hours and hours, they usually end up mushy and the nutrients have likely escaped with the long cooking times. In the pressure cooker, the yummy goodness doesn’t escape with the steam. Frozen meat? That’s okay! You can literally eat in less than 10 minutes depending on what meat you are cooking. Chicken Breasts are the fastest as we usually cook our frozen breasts for 7 minutes per pound. You can sear meats right in the pot! I don’t know about you, but I love a good sear on my meats. Most programmable pressure cookers have a saute option where you can saute for as long as you would like to get that awesome brown on your meats then just hit the pressure cooking button and wait for your food! No more multiple dirty pans or pots. Want to make mashed potatoes or applesauce WITHOUT cutting them into pieces and waiting HOURS for them to soften? You can literally pressure cook big veggies like this whole and have a great tasting mashed potato dish within minutes of putting them in the pot. Check out how I made spaghetti squash in under 20 minutes. No more over cooked, mushy meals as long as you stick to the appropriate times for cooking your food! You can easily cook pasta and end up with a perfect al dente noodle!